DBF is one of the oldest database formats. Being used since late 80s, it is still extremely common. However, not all DBF files are the same. In fact, the DBF format itself suffered a lot of changes since its first appear. And while DBF offers backward compatibility since dBase III+, you still need to make sure a database administration tool you use correctly opens each and every DBF file you may have. 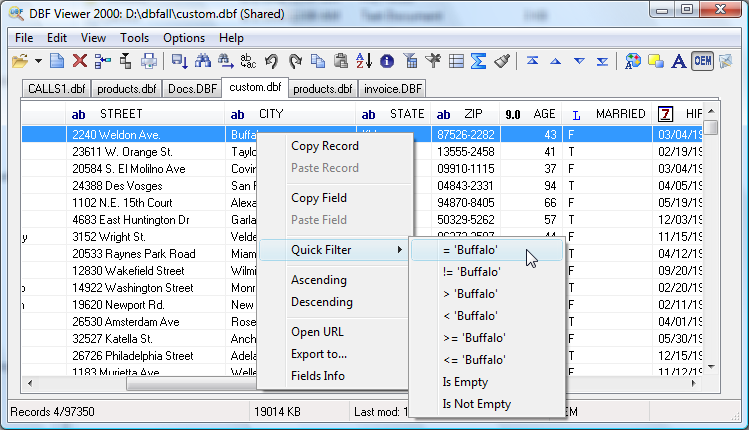 To open a DBF file, click File | Open menu (Ctrl-O), or click the corresponding icon on the toolbar. In the file opening dialog box select the file(s), use Ctrl and Shift keys for multiple selection. To open dbf file with other extension (non .dbf) you need to enter file name with extension to open file dialog and click "OK"
Each opened dbf file adds a new tab under the toolbar displaying the file name; click the tab to view the desired file. Note, if you associated DBF Viewer 2000 with the DBF format during the setup process, you can open any DBF file by simply double-clicking it.